Find artworks, auction results, sale prices and pictures of James Michael Brown at auctions worldwide. London 30th May 2012 a 13.27 x 20 inch pencil and grey wash en grisaille sold for £67,250 (premium). 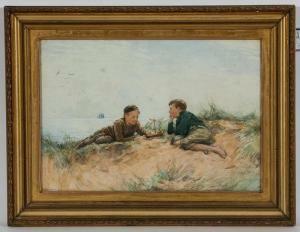 * JAMES MICHAEL BROWN (SCOTTISH 1853 - 1947), AMONGST THE DUNES watercolour on paper, signed and dated 1890 38cm x 55cm Framed and under glass Note:J Michael Brown painted mainly landscapes and is renowned for his usually Scottish golf scenes in watercolours which are highly sought after. 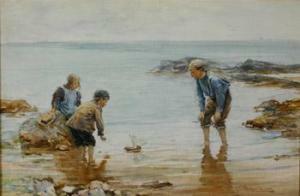 Lot 202 Christie's, London 30th May 2012 a 13.27 x 20 inch pencil and grey wash en grisaille sold for £67,250 (premium). Christie's Scotland, 16 July 1992, Lot 610. Trained at the Royal Scottish Academy, (James) Michael Brown was born in 1853, the son of a Fife engraver. He exhibited at the Royal Academy between 1890 and 1900, and at the Royal Scottish Academy between 1879 and 1897. In 1838 the Life Association of Scotland was established in Edinburgh, later forming the Insurance & Banking Golf Club (which was then renamed Duddingston Golf Club). 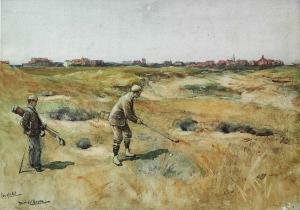 In 1898, to mark the opening of the extended Club House, Brown was commissioned to paint a scene from an exhibition golf match at the Club. Brown's painting was then printed as the centre piece of the 1899 Life Association of Scotland calendar. The calendar was voted a great marketing and advertising success. The Life Association of Scotland board justified the expense by stating 'it must surely be the aim and desire of a Life Assurance Association to prolong the lives of those who take out policies with them and what sport is there that can compare with golf as a cure for all the ills that flesh is heir to...' Brown was commissioned to paint a golfing picture annually for the Life Association (1893-1916). Prints were made of the originals and glued to the cardboard calendar for each year. Brown painted 26 pictures for the Life Association and these all adorned the walls of the Edinburgh head office for many years. Most of his artwork was painted in watercolour and pencil en grisaille which produced a clarity that at first glance resembles a photograph. Brown often had the famous golfers of the time sit for him, whilst at competitions, and he used these studies to help him later reproduce the accurate likenesses of the players in his paintings.